Herbal actions: laxative, demulcent, refrigerant, anti-Inflammatory. A poultice of chickweed can be especially useful topically for inflammation, abscesses, and anything itchy. Internally, it’s a gentle laxative and is soothing to the digestive tract. Not surprisingly, this cooler-weather plant is also cooling to the system. To learn more about using plants like chickweed for healing, you’re invited to our herbalist class. Chickweed’s pretty packed with nutrients, especially for such a diminutive plant. It contains vitamins A, D, B complex, C, rutin (a bioflavinoid), calcium, potassium, phosphorus, zinc, manganese, sodium, copper, iron and silica. In comparison with spinach, chickweed holds up extremely well. It’s got just as much iron, along with other nutrients. So, when you’re trying to eat you’re daily dose of nutrient-dense leaves, consider this weedy wonder along with the better-known greens. For an all natural spring “cleanse” we love eating chickweed along with pokeweed (properly prepared), nettles, and wild mushrooms. There are many species of this awesome plant. The one that we use the most, common chickweed (Stellaria media) is native to Europe. At this point it’s naturalized in North America and grows virtually everywhere in this continent too. 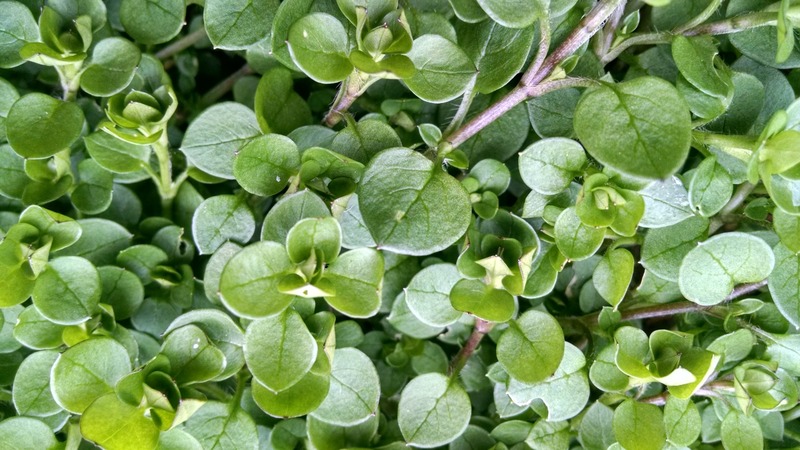 Chickweed has a long history of use as a nutritious edible green by both humans and animals. The ancient Greeks even wrote about using chickweed, and it was also commonly consumed in ancient Ireland. Star chickweed (S. pubera) is native to our rich cove forests here in southern Appalachia. Although this species is less abundance, it’s perhaps even tastier, and more choice than the common variety. 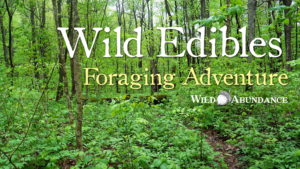 During many of our Wild Edibles Foraging Adventures, we’ve feasted upon heaps of salad, primarily composed of star chickweed. Natalie willed this wonderful weed into the Wild Abundance garden, now it comes up without fail in early spring and with her winter cover crops. She started eating chickweed regularly when she lived at Wild Roots, and since then it’s been a staple in the garden and kitchen. 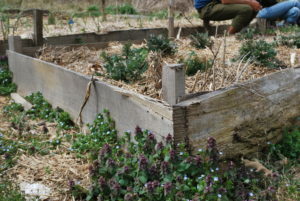 Chickweed flourishes under row cover with the kale and in the paths, which are protected by raised beds to their sides. Our permaculture apprentices enjoy salads of chickweed during their stay here. You can transplant chickweed into your garden; just dig up a clump and nestle it in a corner, or wherever you want it. It’s a funny thing to desire a weed in a garden so very much, but chickweed is a very well-behaved and generous one. In fact, it doesn’t seem to compete with cultivated plants, and it yields a tremendous amount of healthy food. Generally chickweed likes a nice combo of moisture and sun. It will thrive in springtime, die back during the hotter months, then reappear when things cool down. In the wild, European chickweed tends to appear on forest edges. Native “star” chickweed pops up in the forest, as it appreciates more dense shade. 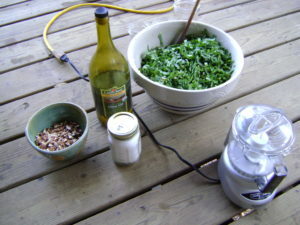 Harvest chickweed with a knife to avoid dirt; rinse and swing to dry.Make pesto in batches; add half of olive oil first to food processor or blender, then add garlic, then salt, and finally the greens. Eat fresh, store at room temp for up to a week, or freeze for up to 4 months. Freeze in ice-cube trays, and empty into ziploc bags so that you can defrost just the right amount of pesto.